Students from the University of Maine at Fort Kent and the University of Maine at Presque Isle will gather for a unique political debate between UMFK’s College Republicans and UMPI’s College Democrats on Friday, March 11 from 5-7 p.m. in the Fox Auditorium at UMFK. This will be a formal debate, and attendance by community members of all ages is encouraged. 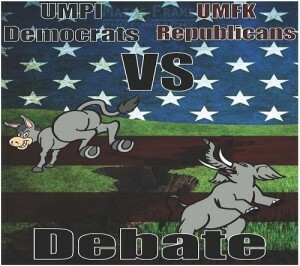 A panel of four UMPI College Democrats will square off against four UMFK College Republicans to debate many of the key issues in the upcoming Presidential election. UMFK Assistant Dean of Student Life and Development, Ray Phinney, will serve as moderator for the event. Admission is free but donations to local charity will be accepted: there will be a 50/50 raffle by UMFK’s Kappa Delta Phi fraternity on behalf of Homes for our Troops, and UMPI Democrats will be collecting donations to benefit the region’s local homeless shelters. UMPI students have been collaborating with the UMFK College Republicans organization to plan a first annual political debate between the two schools. The idea was originally presented by DeLuca to Katharine Waldron, UMPI Student Representative to the University of Maine System Board of Trustees. The two and their fellow students are working to create an event focused on engaging campus and community members on the political issues and topics in the news right now. Organizers hope to welcome a crowd to Fox Auditorium for this first annual event. For more information, please contact DeLuca at dominic.deluca@maine.edu or Waldron at katharine.waldron@maine.edu or 207-703-8143.